It’s our goal to bring an attitude of simple pleasure and enjoyment to our wines. 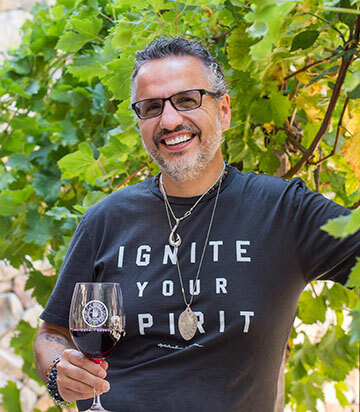 Dario is both the winemaker and the Master Pizzaiolo at Ca’ Momi Enoteca. Torchiato di Fregona, a dessert wine made from Prosecco grapes. It is made near my hometown in Italy. Robert Mondavi, for his passion and vision. I spend my days around food, wine and friends. It doesn’t get much better! To keep a family-like business culture as our company grows. It’s still a little California agricultural community at heart, despite its prestige. We maintain our vineyards organically. We stay away from chemicals and try and conserve resources as often as possible. We use Napa Valley fruit and embrace its quality, but we celebrate it playfully. The two other founders and I grew up in Italy understanding wine as part of our everyday meals and life; it’s our goal to bring an attitude of simple pleasure and enjoyment to our wines. I’d be a pilot, or a world-famous soccer player. Terces and Mathew Engelhart, owners of Café Gratitude, and my dad. Intern, assist, volunteer...just get your hands dirty. So much of winemaking is learned by being in the action. My passion for pizza making. It started out as a hobby I learned in my college years (it helped me pay tuition)—and it grew into an obsession. I make a mean pizza Margherita. Come try it sometime at Ca’ Momi Enoteca!